Once you have moved into a new home, it is important that you change the existing locks in the house by replacing them with new locks. You never can tell who have spare keys to your house and what would happen after you have gone out of the house. So, the safest way to keep your valuables intact and your privacy maintained is to carry out a process of new locks installations. Apart from the above, there are other reasons why you will need to change your lock. If you have locked yourself out of, you will need to change your existing locks and install new locks. Our track record in providing house lockout service will help you to resolve such predicaments in a matter of minutes. Again, if it happens that your locks are becoming unreliable and difficult to open, or requires an upgrade to comply with an insurance standard; installing a new lock becomes paramount, for which our rekey service is always on ground to help you get back into your home or office. How long will it take to install new locks? 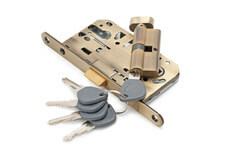 There is hardly a specific time frame needed to install new locks. The time for the installation process is dependent on a number of factors. First, it will depend on the nature of your door—the material design of your door. Most residential apartments today are made of wooden doors, while some others are made of steel. The time for installing a lock on a wooden door varies compare to the time needed for installing same lock on a steel door, which is why it’s very important to notify the locksmith in advance. Secondly, the installation time will vary depending on whether the holes needed for the locks have been drilled or not into your door. If they have already been drilled, our lock repair will get on straight with the new installation. But if they have not be drilled, the installation time will take much time than necessary because our locksmith must have to drill the necessary holes to affix the locks. Lastly, the installation might also depend on the type of lock the homeowner wants to install. The lock could be just a simple knob latch bolt or a combined doorknob and a deadbolt to create better door security. Whatever it is, the lock installation shouldn’t take more than 30 minutes if done by a professional technician from one of our mobile key service unit. What are my options when I want to install new locks? Nightlatch or Yale type lock – this type of lock comes in different dimensions/back sets and it is used in front and back entrance doors. The door is latched shut by slamming it shut and it requires to be open from the outside using a key. This lock type is the one that is usually fitted into the door and is normally operated by a silver type or longer brass flag type key having teeth in a symmetrical pattern at the end. There are two types of Mortice locks—the Mortice sash lock, for which the latch on the lock is operated by the handle which allow the door to be shut when pulled closed; the Mortice Deadlock—which doesn’t have a handle but usually operated using a key from one of both side. 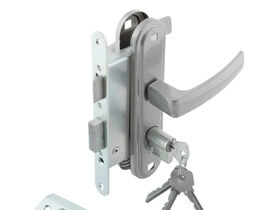 This is a very popular type of lock seen on most residential doors of different types and on security appliances. They come in different sizes, designs and security levels when you need to install new locks that suit your security needs. Changing or fitting any type of lock yourself is a risky thing to do, as you could unintentionally be putting your valuables and privacy at risk theft and burglary. To get a reliable, professional and quality locksmith service today, contact Chiko’s locksmith today and get your locks perfectly installed.